Recently a reader wrote to us asking about bullet inserts to encourage families to integrate faith into their home life. I passed on the idea to Nicole and she created this resource. It can easily be printed and distributed to all the congregation or just to parents. 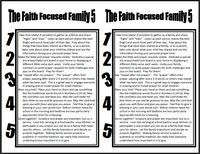 It has five practical tips for parents who want to develop a faith focused family. Directions: Click on the preview image or click here to download this bulletin insert as a printer friendly PDF file. Below is the full text of the document. 1. Take time (daily! if possible) to gather as a family and share “highs” and “lows”. Listen as each person shares the best (high) and worst (low) part of their day. Pray about the things that have been shared as a family, or as a parent, take note about what your child has shared and use the information during your personal prayer time. 2. Make the Bible and prayer requests visible. Dedicate a special dry-erase/chalk/cork board in your home to displaying a different Bible verse each week. Invite your family members to write prayer requests for both challenges and joys on the board. Pray for them! 3. Say “repeat after me prayers”. The “prayer” offers their prayer, pausing after every 2-4 words so others may repeat what has been said. This is a great way to engage everyone in praying and to model prayer for small children. 4. Bless your kids! Place your hand on them and say something like the traditional words found in Numbers 6:24-26, May the Lord bless you and keep you. May the Lord make His face shine on you and be gracious to you. May the Lord look upon you with favor and give you peace. Feel free to give a blessing in your own words too! Before children leave for school in the morning and bedtime are two particularly appropriate times for a blessing. 5. Serve together! Scripture and prayer are important, but so is service. Look into serving at a food pantry, soup kitchen, or participate in any project you can do as a family that helps care for others. Let the family brainstorm and decide on projects together. Making family service projects a quarterly or monthly tradition can really help everyone understand how important it is to give. Need More Ideas? Browse our resources for family worship or adapt our kids Bible lessons for family devotions. Tony Kummer (Editor) reviewed & updated this page on : June 1, 2010 at 12:55 pm. All our content is peer reviewed by our readers, simply leave a comment on any post suggest an update.